During the 2010 DCI World Championship Semifinals, we had a chance to relive musical selections from the nine years of Star of Indiana, courtesy of the Star of Indiana Alumni Corps. Accompanied by visual highlights on Lucas Oil Stadium's twin video boards, the presentation reminded us of the power and glory that was Star of Indiana in its all-too-brief existence. For only having been around for nine years before morphing into what ultimately became the "Blast!" theatrical show, Star of Indiana had a remarkable impact on the drum corps community. The corps worked its way up through the ranks slowly and methodically, placing 10th its first season in 1985, followed by placements of 8th, a tie for 7th, 7th outright and then 6th in 1989. Due to the radical style changes during each of those years (and after), Star became known as DCI's "Chameleon Corps," performing a wide variety of shows based on Disney music, outer space, the circus, Gershwin melodies and British folk songs. Peformance excerpt from Star of Indiana's 1990 production. Star of Indiana became a major player in 1990 with Sir William Walton's "Belshazzar's Feast." A British composer, Walton's music was anything but what one associated with the folk melodies of the previous year. Based on the Biblical story of the Babylonian King Belshazzar found in the book of Daniel, published 2,600 years earlier, the show grew out of the original source material, written for orchestra, split choirs and antiphonal brass bands. Turning up the horn line several notches in both performance quality and difficulty, the production was frequently described as being a "spectacle." The show commences with representations of various pagan gods of gold and silver, brass and iron, wood and stone, heard in the front ensemble of the percussion and then consecrated by the searing opening fanfare of the horns. An ominous sense of foreboding overtakes the field when King Belshazzar is warned of his impending reckoning and the doom of his empire with a banner representing the words that mysteriously appeared on the palace wall. "Mene, Mene, Tekel, Upharsin" is loosely translated as, "God has numbered the days of your kingdom and brought it to an end." The brass stabs were as lethal as the candelabrum that shattered the king's skull later that very night. Jubilation of the masses follows as the people of the kingdom celebrate their freedom from the king's oppression. Visual designer George Zingali's magic is on overdrive here as a block star magically appears from nowhere into an outline and then into a rapid succession of star-like forms before turning into the cross that Zingali would use again the following year in his magnum opus spectacular finish to the corps' 1991 Championship-winning production. With "Belshazzar's Feast," Star of Indiana served notice that they were one of DCI's major players. Although today DCI's oldest marching members were born the year of that production, they are aware of the mystique still cast by the corps. 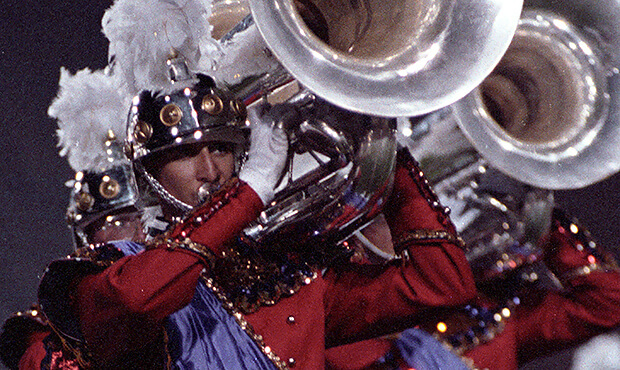 Twenty-one years later, this production still resonates as a grand creation that remains an important link in the evolution of drum corps spectacle. This week only, you can save on 1990 World Championship Audio and Video Performance Downloads on the DCI Fan Network. Buy the 1990 Star of Indiana Video Performance Download. (Available this week only for $3.99. Regular price: $4.99.) Buy the Audio Performance Download bundle of all 12 Finalists from 1990. (Available this week only for $15.99. Regular price: $19.99.) Offer ends Monday, Feb., 14 at 8:30 a.m. ET.